I am not good at styling my hair, nor am I known to do super cute and creative hairstyles. As I’ve gotten older, I’ve come to grips with the fact that my hair is long, fine and straight. It rarely cooperates when I want to try something new. That is until a few years ago when I started putting my hair in this braided ‘do, and people would stop me in public to compliment it. Even to this day when I go out like this, I have at least one person come up to me in the store to ask me about how I got my hair to look like this. The good news is that if you know how to french braid (or can at least fake it), you can master this style in five minutes or less. I find this works best on damp hair, but if your hair already is dry, just use dry shampoo or working hairspray to give it some grit and texture. And, your braids and bun don’t have to be perfect – this style should be effortless, so if your braids are loose or you have layers falling out of your bun, it’s not a big deal! 1. As discussed, start with damp hair or air-dried hair. Add some dry shampoo or working hairspray for texture. 2. Part your hair per your preference – for this style, I like mine parted close to the middle – and split into two sections. Use your hair tie to pull back one side while you work on the other. 3. Section off approximately an inch of hair, and split into three sections. Begin your french braid. 4. Continue braiding until you reach your ear or right behind it. 5. 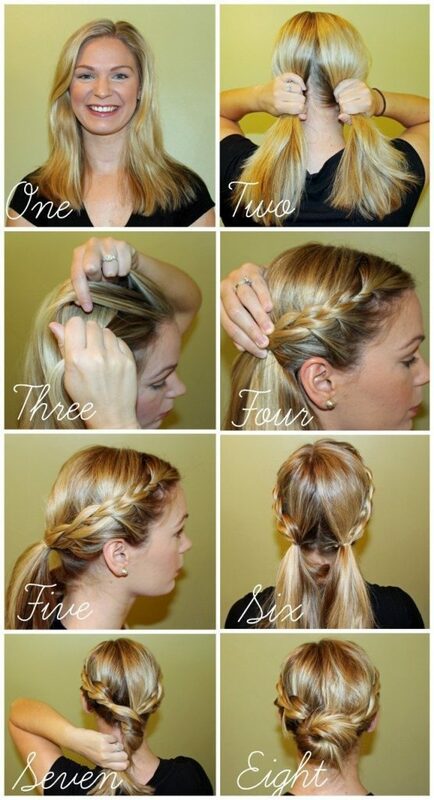 Using one of the clear elastics, tie up the braid and the extra hair below it into a ponytail. 6. Repeat on the other side. You should be left with two pigtails. 7. Twist the two pigtails together, and wrap them around to form a bun shape. 8. Secure the bun using the hair tie. Bobby pin any loose pieces, and finish with a layer of hairspray. If you try out this style, don’t forget to tag me on Instagram and use #mitmbeauty! Totally wish my hair was long enough so I could do this! Such a cute look. Oh, that's a great idea! I never thought to just try twists. I bet that would look super cute! I'm sure you could pull it off – you may just need to use a few more bobby pins in your bun! Super cute, I love this! I love this! I'm pretty clumsy when it come to french braiding anything but a single strand, but I do this look sometimes just by twisting the two sections back and pinning along the way. This is probably more secure though! Super cute on you! I am terrible at french braiding on myself! I love this! I haven't done braids, besides my bangs, in a long time. Definitely need to add to my hair arsenal. This is so cute! I can never get my braids even when I try and do one on each side but yours look amazing! This is so cute! I am not sure if my hair is long enough, but I am saving this for later! YouTube videos and lots of practice helped me perfect the art of braiding … I will say it's been a bit trickier though since I put more layers in my hair at my last hair appointment! Just like I told Biana, check out YouTube video tutorials! That's how I learned to french braid, and I'm still not that great at doing it on myself – I kind of fake it sometimes. this is so cool! great step by step! Love this! I really need to step up my braiding game… I'm sooo bad at it! That looks great! I've been practicing my self braid but it is hard work! Ok. Can you come do my hair sometime?! 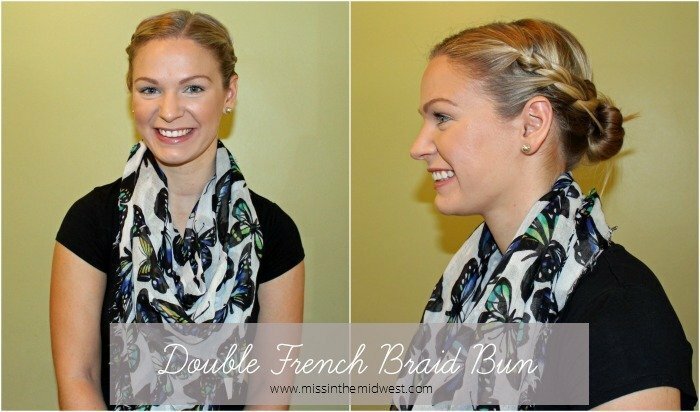 I cannot french braid to save my life, but I LOVE this hairstyle! So pretty. I think I just need a tutorial on a regular french braid before I can even attempt your pretty hairstyle! !